Joan Baez is an American folk singer who was an important part of the early 60s folk music revival. 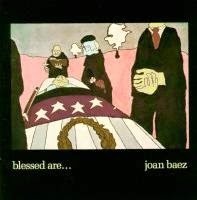 In 1971 Joan Baez parted ways with Vanguard Records, the label she had been signed with since the beginning of her career. Her last release with them was a sprawling double album, Blessed Are. It was produced in Nashville by Norbert Putman, and like her last couple had very strong country leanings. It was notable for featuring a high number of original songs, as she was beginning to develop as a songwriter and no longer rely on the work of others. Nevertheless it still had a large number of cover songs, numbers by Mickey Newbury, Kris Kristofferson, Roger Miller, Jesse Winchester, The Band and both The Beatles and The Rolling Stones. It turned out to be a very successful album, as it generated a surprise hit single - her cover of The Band's "The Night They Drove Old Dixie Down" went all the way to #3 on the singles chart. Subsequently the album went Gold. I listened to this double LP today for the first time ever. It was excellent! The fact that it does not sound dated, and is from 43 years ago is a credit to the artistry of J.B. and backing musicians when they cut this vinyl.